Home / Chicago / TBOX, Chicago’s Famous 12 Bars of Xmas Pub Crawl, is Coming Saturday, December 10th! TBOX, Chicago’s Famous 12 Bars of Xmas Pub Crawl, is Coming Saturday, December 10th! 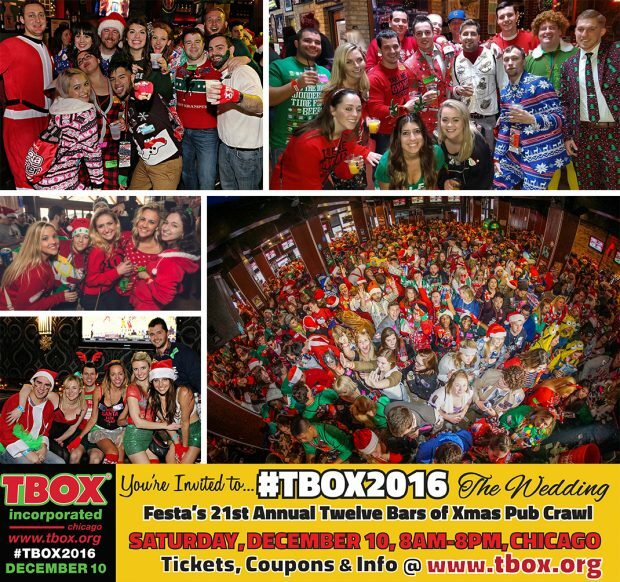 November 21, 2016	Chicago Comments Off on TBOX, Chicago’s Famous 12 Bars of Xmas Pub Crawl, is Coming Saturday, December 10th! This year, TBOX Incorporated will hold its 21st Annual Twelve Bars of Xmas Bar Crawl in Wrigleyville, Chicago, a holiday tradition that attracts tens of thousands of partiers every year to 40+ neighborhood bars. The theme for this year’s event is “TBOX, THE WEDDING“, and Attendees are encouraged to dress in crazy bridesmaid dresses and other wedding attire in addition to the usual holiday garb. Tickets are available now on the TBOX Website (www.tbox.org) and include a fashion t-shirt, $12 of food and drink tokens, and exclusive admission to the 40+ bars all day from 8AM in the Morning thru 8PM at night. Event also features the famous “TBOX Cereal Shots“, Over 200,000 Stickers, Snapchat Scavenger Hunt Contest, and Over $250,000 donated to local charities since 2009. Readers may use the coupon code “ARK” to save on tickets!